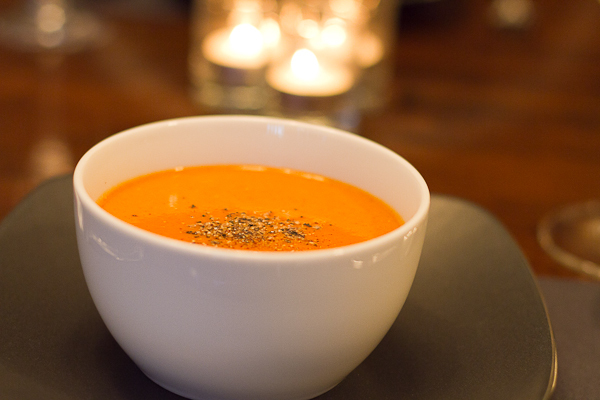 Patricia Delicia’s Butternut Squash Soup. The best recipes are those that can be prepared in a pinch but taste like weekend food. Even better recipes are those which are also high in nutritional value. This one has it all. Such recipes don’t come along that often but when they do, I look forward to sharing them with you. My friend Patricia, “or Delicia…” lol, loves to cook and until recently had only brought me her delicious desserts to try. On one particularly beautiful autumn day, she brought me a little of this soup to sample and served it in a cute little cup. It was so good that I of course needed this recipe. After her 30 second explanation, I couldn’t believe it. It was so simple that I was sure she had forgotten a step, an ingredient, something! It tastes and feels gourmet but requires very little time and ingredients. Also, this little gem of a recipe is so versatile. I’ll provide you with the basic recipe but feel free to add some other complimentary flavours. This soup is perfect for dinner parties or for a delicious and comforting weeknight meal. Sauté your onion until soft. Add your chicken stock and bring to a boil. Lower heat and simmer until cubes are soft enough to break apart with a fork. Purée soup with your immersion blender, directly in the pot, until smooth. Note: if the soup is too thick, simply add more liquid and simmer just a little longer. Add salt if needed and freshly ground pepper. Stir in cream and pour soup into bowls. Now dress it up! Right before serving, I like to add finely chopped chives or parsley or even cilantro leaves. I also like to add a sprinkle of nutmeg into each bowl (without stirring it in, I like it to rest on top). The nutmeg’s flavour goes so well with squash and is really reminiscent of all that is Autumn. I served my soup with toasted slices of baguette , rubbed with garlic and drizzled with olive oil. You will feel really good about eating this! Our friend the Butternut squash delivers an ample dose of fiber, making it exceptionally heart-friendly. It provides significant amounts of potassium, important for bone health, and vitamin B6, essential for the proper functioning of both the nervous and immune systems. The folate helps guard against brain and spinal-cord-related birth defects. Squash’s orangey hue, signals high levels of beta-carotene (which your body automatically converts to vitamin A), identified as a deterrent against breast cancer . With only a 1-cup serving, you get nearly half the recommended daily dose of antioxidant-rich vitamin C.
As if this weren’t enough, butternut squash may have anti-inflammatory effects because of its high antioxidant content. Need I say more? Patricia, thank you for sharing this great recipe with us! Next Post Slow cooker, where have you been all my life?